A great deal of thought has been invested in the studios, control rooms, technology and concept behind Nairobi’s new local radio and audio/video streaming channel, NRG (Energy) Radio. With high-profile staff recruitment and test transmissions made over the past three months, NRG Radio has brought a new wave of radio technology to its premises with its Lawo crystal and sapphire radio mixing consoles and R3LAY virtual radio mixers. Launched with the claim “we’re gonna change the way you listen to music”, NRG Radio is changing the way its programming is delivered. Its three IP-based studios with visual integration are capable of streaming live video from the studio to any content distribution network, social media platform and other avenues. As the only other broadcast system integrator in Africa to have implemented a similar system, Nairobi-based BYCE Broadcast was contracted to set up the entire to-air chain. This involved equipping three state-of-the art studios, a production room and a central technical area (CTA), as well as the transmission of the broadcast signal. Three key phases were planned to ensure the smooth and speedy progress of the project. These began with the equipment setup for Studio One, installing a 12-fader Lawo crystal mixing console with integrated router plus advanced radio automation software with 720p HD video playout capability and six-channel video mixing software with integral CG and graphics generation to add the station’s logo, news crawls, weather info and custom legends. The second step was the transmission area, which involved the erection of a 24m mast at the client’s site to facilitate a microwave point-to-point link to the Limuru broadcasting site where an eight-bay omni-directional antenna provides a broadcast diameter of about 100km. At this point, the studio went on-air during the second week of December 2017. The second studio is equipped with a 12-fader Lawo sapphire console – with the addition of more channel modules, a sapphire can be transformed into a true production mixing console, placing a total of 60 faders at an operator’s fingertips. Features such as Autogain and Automix enable the console to take control of the entire studio. The third studio is a ‘virtual studio’, which is configured around Lawo’s R3LAY virtual console. Due to its portability, the R3LAY virtual mixing console offers NRG Radio the best fit for its requirements, both in terms of OB, studio operations and the aim to make the studio design special and unique – it’s a futuristic and cool setup, with very few components in studio. 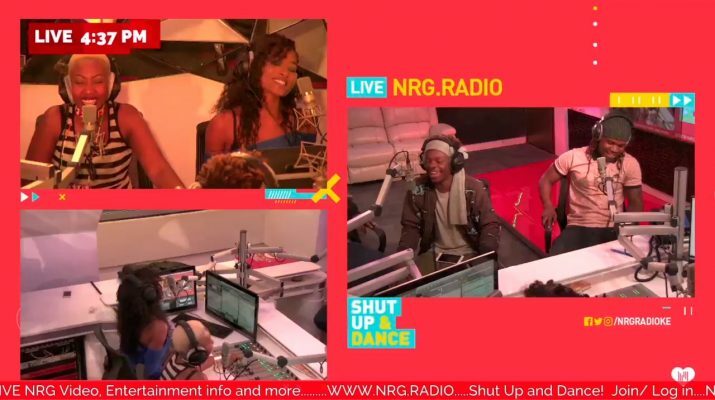 In less than four months, NRG Radio was up and running as a visual-radio FM channel with an online audio and video stream. BYCE Broadcast also facilitated the training of the NRG Radio staff, including presenters, traffic and the managerial staff. The presenters went on-air by audio/video streaming with NRG Radio on March 4 – and you can see the fun they have!